The number of prescriptions for antidepressants in England has hit a record high despite national guidance advocating alternative treatments. 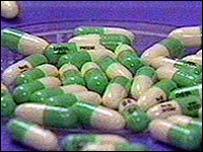 More than 31 million prescriptions for drugs such as Prozac were issued in 2006 - a 6% rise on the year before. The figures come as two studies showed "startling" benefits of country walks in people with depression. Mind, the charity that reported the findings, said GPs should consider "ecotherapy" as a valid alternative. The National Institute for health and Clinical Excellence issued guidance in 2004 recommending that antidepressants should not be used as first-line therapy for mild to moderate depression. Instead patients should be offered guided self-help and psychological therapies in the first instance. But figures from the Information Centre indicate the number of prescriptions for antidepressants are still on the rise. In particular prescriptions for a group of drugs known as SSRIs, which include Prozac, rose by 10% last year from 14.7m to 16.2m. There have been fears that the drugs are linked to suicidal thoughts and self-harm in some cases. In 2003, experts said SSRI antidepressants should not be given to teenagers after experts' concerns they made some patients suicidal. However, Prozac is still recommended for under-18s, as it is thought that the benefits of taking this particular drug outweigh any potential risk, but only for those with severe depression. Mind, the mental health charity, say the UK is trailing behind other countries in the use of other therapies. In the Netherlands, Italy, Germany, Austria, Belgium and Slovenia, patients with depression are prescribed agricultural work. Holland has 600 care farms that are part of the health service compared with 43 in the UK none of which are aimed at mental health. In a report on ecotherapy, Mind said 93% of GPs have prescribed drugs due to lack of alternatives. Ecotherapy, described as getting outdoors and getting active in a green environment, should be considered as a treatment option they said. Participants also felt much less tense and reported greatly increased self esteem after a green walk. But after a walk in a shopping centre, 50% said their feelings of tension increased and 44% said their self-esteem decreased after the walk in a shopping centre. A separate survey of 108 people who regularly take part in green activities run by local Mind associations found 90% said it was the combination of nature and exercise that had the greatest effect on them and 94% said green activities had lifted their depression. Paul Farmer, chief executive of Mind said ecotherapy was a credible, clinically-valid treatment option and needs to be prescribed by GPs especially as access to treatments other than antidepressants was extremely limited. "We're not saying that ecotherapy can replace drugs but the debate needs to be broadened." Marjorie Wallace, chief executive of the mental health charity SANE, said: "GPs are now encouraged to diagnose depression yet without the availability of qualified counsellors and therapists they have little choice but to hand out a prescription - or send the patient away empty-handed, leaving them with less hope of treatment and recovery." The NHS is currently rolling out a programme of providing people with access to computerised CBT and the government has set up 10 pilots to explore ways of speeding up access to talking therapies. A spokesperson for the Department of Health said: "Central to our efforts is the ability for people who are ill to be able to quickly get the right kind of therapy, instead of being prescribed medication." They added the demonstration sites were showing early signs that quick access to therapy reduced the time that patients are ill and helps individuals to regain their independence. Professor Mayur Lakhani, chair of the Royal College of GPs, said: "We reject the suggestion that GPs prescribe antidepressants too readily. "GPs consider the need for antidepressants only after a careful assessment of the patients¿ clinical condition. "The real story is the lack of access to services such as talking therapies and the long waiting lists for these. GPs find themselves in a difficult position because of limited services."